Try our Blue Label Cigar ( aka Cubana ) eliquid flavour, it is a perfect blend for the perfect vaping experience. Exclusive MaxVol™ technology delivers a smoother, richer maximum volume smoke (vapor), providing a satisfying rich deep ripened cigar flavour. Specially formulated to extend the life of your electric cigarette atomiser, clearomiser and tank. Really good, closest to cigar/cuban out there at the moment. Very good earthy flavour and very reminiscent of cigars I USED to enjoy. very good cigar eliquid which produces very nice smoke/vapour mist. I sopped smoking cigars 12 months ago, first using ecigars and have now moved to eliquids and vaping. 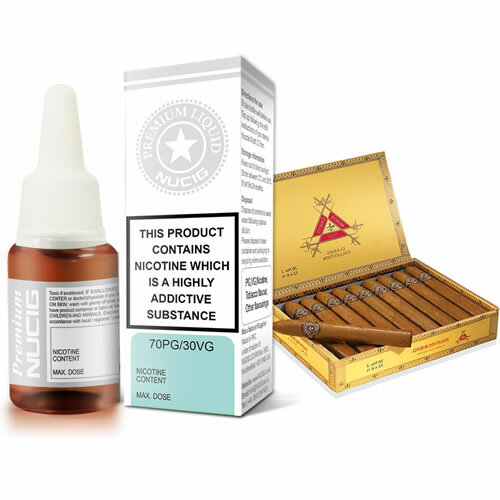 I can highly recommend the E Liquid Cigar Flavour does exactly what us cigar smokers used to like! !